Post any news that doesn't have any specific subject, or ones that're too big to miss but too small to have a topic. So this post isn't completely worthless, my random news: Saw the Spectre extra from the UTRH DVD on youtube. Looking forward to DC pushing more attention to our lesser known heroes. Gonna pick this up, if only because a good portion of the tracks were never released on CD before. Location : In front of the warm glow of my computer monitor. It truly made me go, "O_o REALLY?" Ugh -_-, stupid internet connection, I can't get it. I dread saying these words again but...can anyone tell me what it says? "The Last Patrol!" The Doom Patrol comes out of retirement when a group of villains tries to assassinate them...or perhaps bring them together? "The Mask of Matches Malone!" Black Canary and Huntress, along with Catwoman, pursue Two-Face while Batman, in his Matches Malone persona, gets amnesia and believes himself to actually be a gangster. This episode will feature at least one musical number. XDDD Try asking someone who's actually sitting in front of their laptop. Riri News is BACK with this new piece of interview with James Tucker and Michael Jelenic did only an HOUR ago! Totally fresh from the oven, my friends! The interview regarding the Batman/Scooby Doo crossover will tell us on just how crazy the episode will be! Also includes snips of preview for upcoming episodes! Thanks to Mr. Tucker himself that posted the link on FB, just five minutes ago. Wow O_o, you got this even before DCAU resources did, how do you do it? My awesome secret weapon called friends-with-awesome-people-on-Facebook-and-Twitter. XP lol. Seriously, Mr. Tucker posted it only an hour after it happens. There are so many jokes I could make. So many. Bet I can make more than you. Well, we'll save that duel for later. There are more pressing matters...like why they decided combined coconut and marshmallow was a good idea. Yuck. Wheeeeee I just followed Gail Simone AND Neil Patrick Harris on Twitter (unimportant, but really, I need to get this out XD)! Lalalalalalalalala. Sign up now and let us get to know you! Join our community! Yeah, what Ria said. Say, does anyone know whatever happened to lupe? She's still alive, that I know. Here are bits of Random News. ONE, after Brightest Day, Flashpoint will be DC's next big event. OMGOMGOMG!!!!! Danielle Judviots is getting a role in BTBATB! OMGOMGOMG! *Faints* *fan boy scream* *hyperventilates* *dies and comes back to life* OMG! This is gggggrrrrreeeeeaaaaattttt! 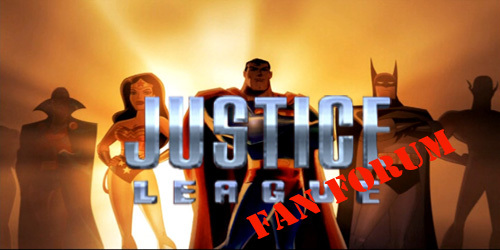 Many thanks to dcfan100 who's been keeping the news flow running around the forum. We love you. NOW that I have about half an hour here, I shall post. Post. AND POST. Batgirl/Shadowcat/Tenten, my favorite voice actress! See wikipedia for more details. Welcome back! Lynda Carter to Megan Fox. Yeah, that's it, show her not to mess with DC heroes. XD! Yeah tell her Lynda! I think Megan's just bitter because of how Jonah Hex turned out. Yeah. I actually saw Jonah Hex on a local DVD store earlier. It was put up next to S/B Apocalypse. I was like, "OOOOOOH JONAH HEEEEX IS OUUUUUT!"